Dispose of all litter properly to avoid wildlife becoming injured. Cut up plastic 6-pack holders and containers in which wildlife can get caught. Pick up and dispose of any fishing line, string more than an inch long, and other bits of garbage that might entangle wild animals. Do not release helium balloons outside. Balloons can choke animals and the string can entangle them. 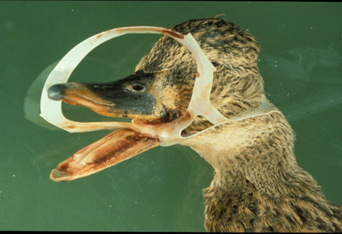 Duck caught in plastic rings. Photo from Google Images. ​Many bird-window collisions can be prevented from subtly marking your windows. See What to do if you Find an Injured Animal for some ideas. Also see The American Bird Conservancy’s Bird-Friendly Building Designs. Protect wildlife habitat, and avoid or minimize activities that harm wildlife habitat. Plant and encourage a variety of native plants. This will also reduce the risk of wildlife eating your plantings, as non-native plants can be a gourmet meal to wildlife. Use humane solutions to discourage wildlife from eating your plants. As previously mentioned, killing “problem” animals will only open up their niche for another animal to move right in (and poison can end up killing non-target animals). Try placing wire mesh around new trees or spraying with homemade solutions (such as 1 egg white to 1 gallon water) or commercial repellents (such as Deer Off™) to help discourage nibbling. If you are concerned about beavers damaging trees, wrap heavy gauge wire mesh (4' high with 2"x4" mesh squares) around the entire trunk of the tree. Check for animal nests before working on your house or yard (e.g., cleaning the chimney, mowing the lawn, cutting down trees, etc). Try to avoid disturbing nests; in most cases wildlife babies will grow quickly and leave the premises. Once the babies are grown you can work on a wildlife proofing plan. ONLY DO EXCLUSIONS AT THE TIMES OF YEAR WHEN THERE IS NOT A RISK OF SEPARATING MOTHERS AND BABIES: AUTUMN TO EARLY SPRING IS BEST. Call a professional and/or wildlife rehabilitator if a nest must be disturbed. 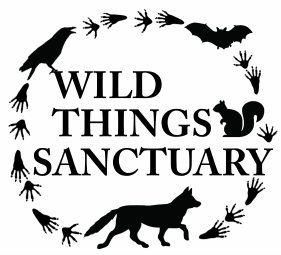 Consider the saying "if you can’t beat them, join them!” Often tolerance of wild animals is the best solution: learn about native species and enjoy wildlife watching.